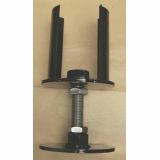 Make life easier with this adjustable ground sleeve. Get the perfect alignment with a simple tweak rather than starting from scratch. For 6-5/8" diameter goosenecks. 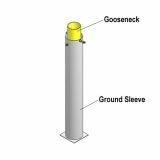 Ground Sleeve for 6-5/8" diameter goosenecks. Standard ground sleeves. 4-1/2" diameter.